Where have we gone on a date last year? As I tried to write this post, I was struggling through the post I’ve written on the other blog as well as pictures for posts we’ve yet to write about. It’s hard to pick the best of because each adventure is unique. There’s always a new story, a new thing to learn even if we’re visiting the same place. So in the middle of my writer’s block, I asked Dudu about last year. Mama: Best Travel of 2016? Dudu: It was last year? 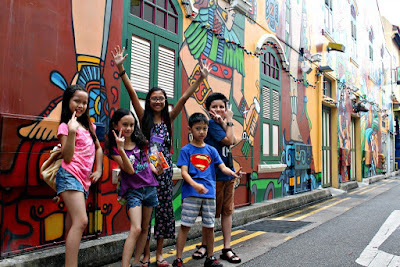 Mama: Singapore and Legoland Playdate? Dudu: That was so much fun too. Dudu: That’s scary, but I love it! Dudu: Do I have to pick? Can we just write about all three? Mama: Okay, now can you write about why each one is the best of 2016? We’ve slept on the car, slept on the plane now we’re sleeping on a train. 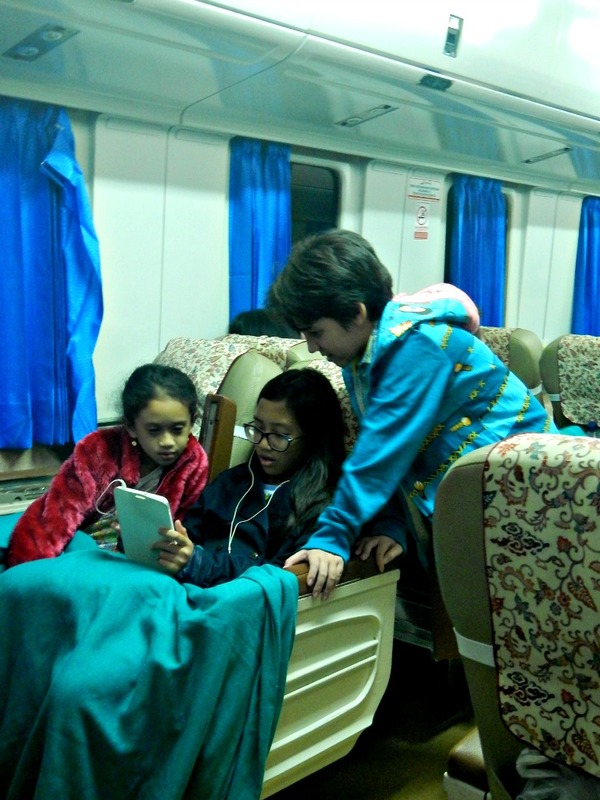 The 16-hour train ride to Malang is a new experience for us. Riding the 6PM Gajayana Train from Gambir, we slept half of the journey and all through Central Java. 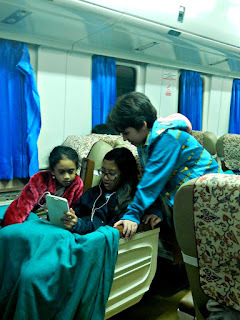 We woke up the next day in East Java. We’ve been on road trips before. When Dudu was younger, we drove to Surabaya and back. But taking a train is different. With cars you can stop whenever, wherever and discover treasures as you go. 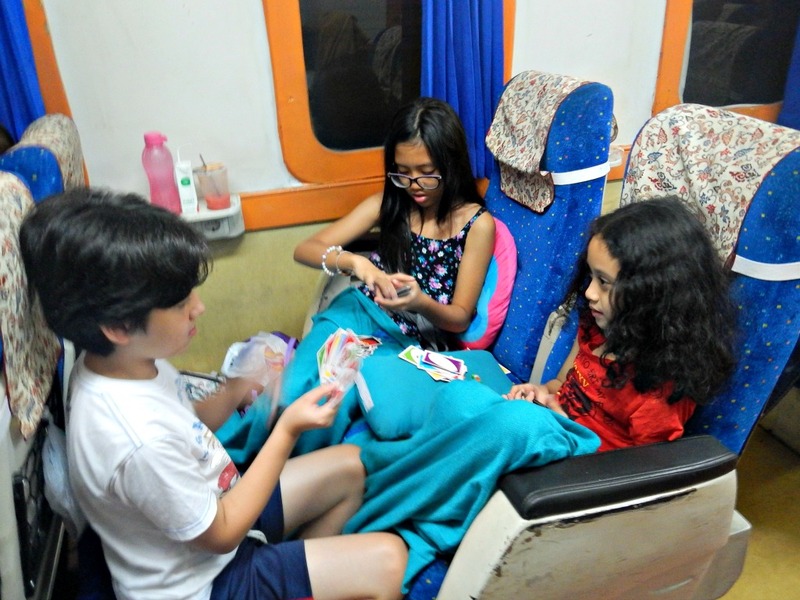 With train you just sit down, sleep and eat, watching the sceneries passing you by without a chance to stop and snap the pictures. But through a train window, you see a different kind of view. “Mom, we’re causing traffic jam because we’re passing through,” Dudu said that night. Buy food on the station. Gambir has great selection. I would bring my own black coffee and UHT milk for Dudu. Make sure you check in early so you won’t be separated with your child. Pillow and blanket are there, but there’s nothing wrong on bringing extra. Bring toys. It’s a long ride. Bring plastic bag, just in case you or your child is experiencing motion sickness. 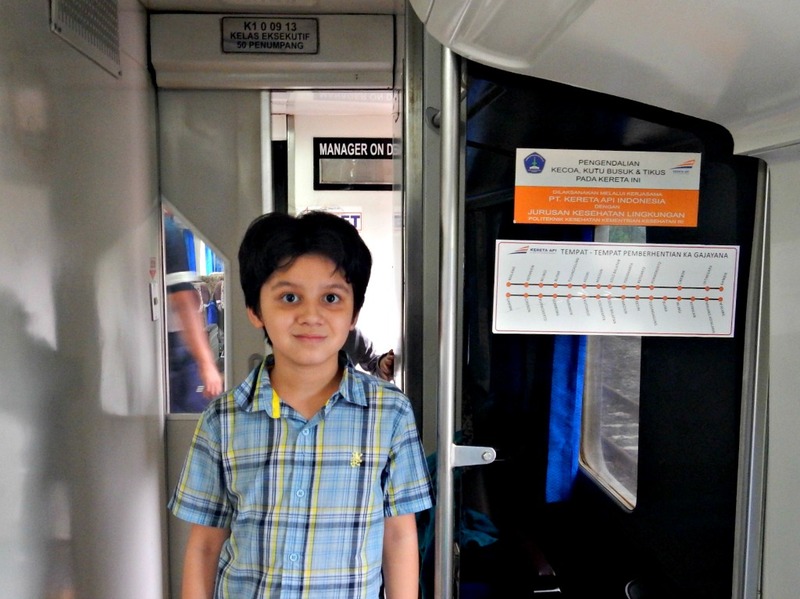 The holiday in Malang and Batu is another adventure, but the journey there is one memorable journey. There were 10 of us. 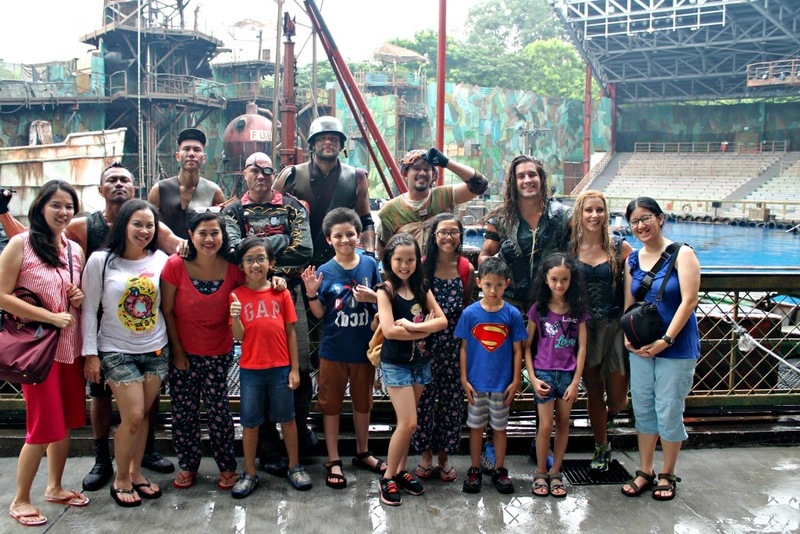 Four moms and 6 kids going on a crazy playdate in Singapore and Legoland. I didn’t know what to expect with this group haha. Dudu was just pretty much excited that he would have friends to go with. Our play date started on Friday morning and ends on Monday night. 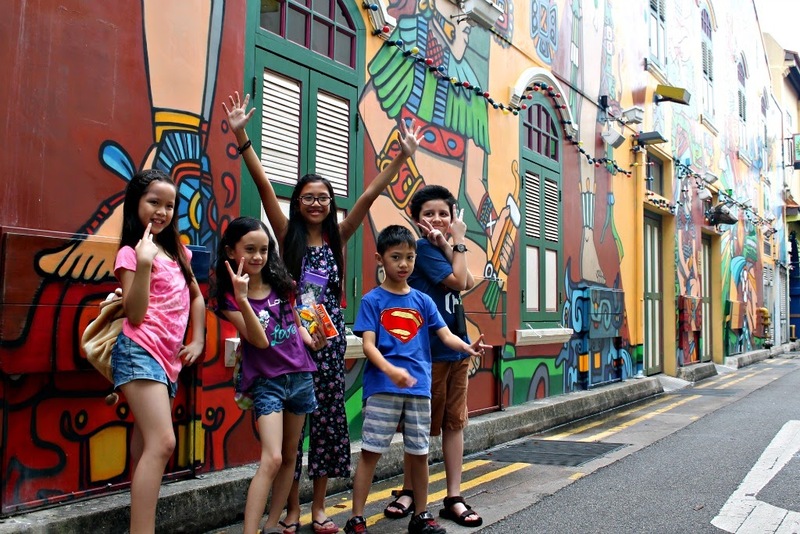 It’s a backpacking kind of play date where we stayed in a hostel with 5 bunk beds, we took the MRT and bus around town, and we dine on street food. We cross the borders, spend days on theme parks and going crazy with shopping. The thing with play date is each child has different personality. 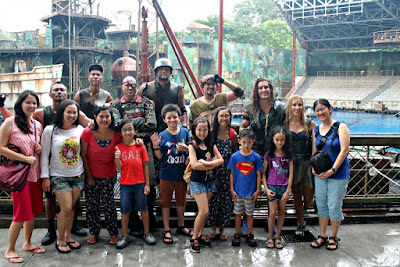 Upon visiting theme parks, the kids are divided into kids with big courage who wants to try every ride their height allowed, the in-the-middle who sometimes enjoy the roller coasters, and the ones who don’t like too much thrills. Luckily for us, the moms are also of different stages. So, there always is someone who took care of the bags haha. I wrote to several publications about the Playdate and got it published. 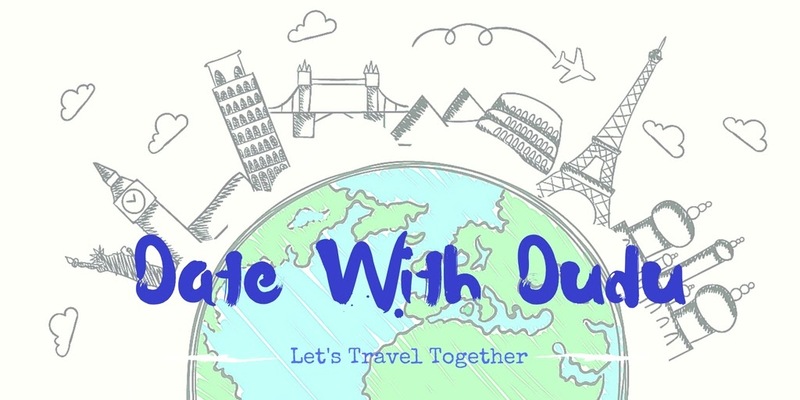 Maybe next time we should try to host an open trip “Playdate with Dudu” to somewhere. Busan? 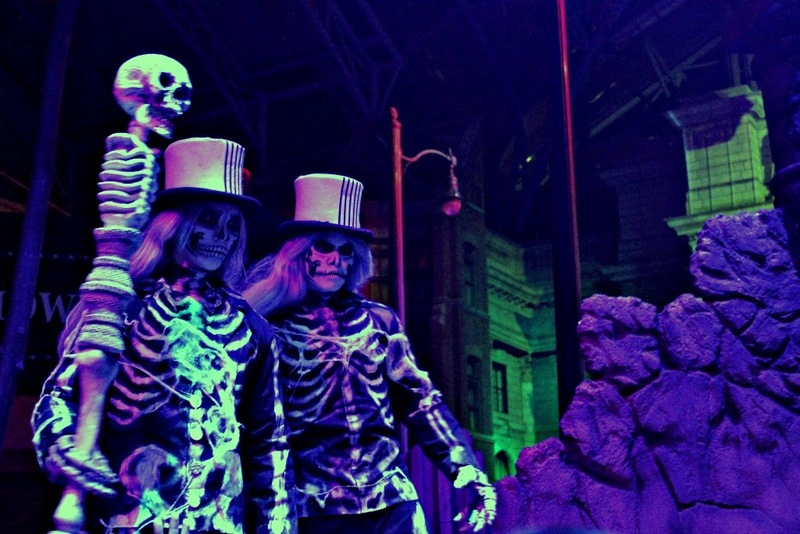 What would it feel to visit Universal Studios after dark, when the humans have gone to sleep and the zombies are taking over? It’s Halloween Horror Night and this year we cross that event off our bucket list. 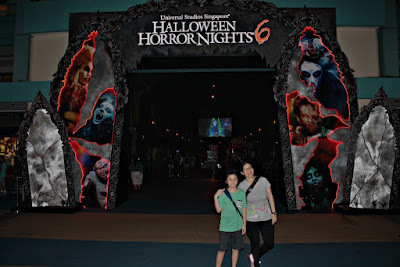 Before we go any further, we have to warn parents reading this, Halloween Horror Night are too intense for young children and it’s not advised to bring the young children into the Haunted House. So, going there with a kid is a waste of money? Well, no. What you can do at Halloween Horror Night? Ride the rollercoaster. Yes, the rides are open. The indoor ones don’t feel any different (except from the line) but the outdoor ones are amazing. 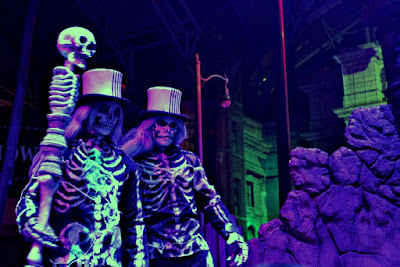 Halloween Horror Night isn’t just Universal Studios at night (the theme park closes at 8 regularly), it’s a rollercoaster on Halloween. Also, this is the right time to catch up on rides you’ve never been to before due to extended lines. Watch the Shows. Each year, they have a surprise. 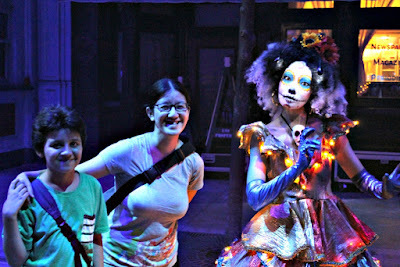 This year it’s Jack the Clown (whose history with Halloween Horror Nights dated back to decades ago in America) and he made a real awesome shows. If you brave enough, line up early and get front seat. He might take you on stage haha. Otherwise, watch from the balcony as some scenes may be disturbing for young children. Souvenirs and Food. Drinking lemon tea from a bloody cup can be cool. Take a break from the underworld and visit scare-free zone at the restaurant on Main Street. Watch the parade while enjoying your sundae. Maybe we’ll come again this year. It’s fun! 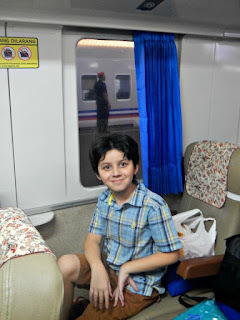 Our last trip to Surabaya was done by car many years ago. This time was different because Dudu’s uncle is dating a girl whose parents live in Surabaya. So our trip to Surabaya in 2016 is more of an extended family vacation. This time we stayed in Hotel Bumi Surabaya, a hidden treasure in the heart of the city. Location-wise it’s real close to Tunjungan, but it’s not like you need to step outside once you’re inside the hotel. Just like it’s name, city-resort, Bumi Surabaya has stores, cafes, park and endless food stalls at its buffet. Pasar Senggol for lunch and Pasar Malam for dinner means an open-air “food court” with both traditional Indonesian and familiar Western food alike. It’s always been my father’s dream to have everyone together for a road trip. We did that as a child, then with Dudu, then when my brother got married, we have his wife tagging along. With my youngest brother’s girlfriend, it’s another full-house event. Dudu is the happiest whenever “the family is complete,” because despite having the girlfriend in Jakarta, my brother is studying in the Netherlands and the other one is living in Singapore with his wife. It’s one of a rare occasion that we had a chance to visit Bandung one weekend. Where to stay? We booked an airbnb at Geger Kalong area, a 4-bedroom house with a real nice view. It’s not the most ideal location, but we love the house and the owner is real nice. Where to eat? We had lunch at Alas Daon, a unique Sundanese restaurant using banana leaves instead of plates. This restaurant allows us to come up to the market area where we can pick what we want, ranging from seafood to chicken and chili. We have to pay before they cook, then we can just sit waiting for the food to come. We went to Sudirman Street for Dinner, the recent hype in town. The pork satay and pork martabak is a hit. This place is always packed especially on weekends, so it’s better to come early if you have a big party. Go around the area and explore before you decide what to eat. Just a warning, this isn’t a halal food area. So, overall, 2016 has been nice to us. 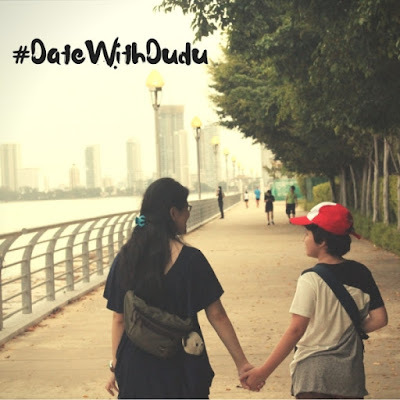 We even managed to pull this datewithdudu.com late last year. We're hoping to make 2017 a well-traveled one as well. This post is a participant of Indonesia Corners "Best Traveling Moments of 2016" collective posting. 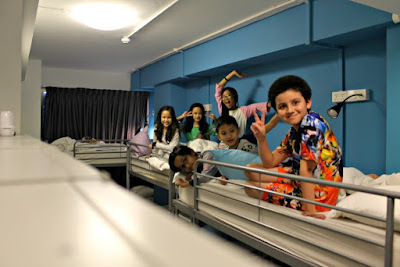 Wow amazing traveling story ya Dudu, ada hotel bintang 6 jugaa, hihihi..mauu deh playdate with Dudu pasti seruu..